Series mainstay Kurt Wallender makes room for his daughter. Feisty Linda Wallender, fresh out of Sweden’s police academy, is ready to inaugurate her own series. Not that her papa (The Return of the Dancing Master, 2004, etc.) does a total second banana as the Ystad PD tries to cope with a religious fanatic bent on mass murder. Far from it: The chief inspector yields only half the stage in his offspring’s debut, since he still has a lot to teach his clever child how to run a high-profile investigation. To her credit, she’s eager to benefit from Kurt’s hard-won experience—except, of course, when his paternal officiousness irritates her so thoroughly that she’d like to bean him with an ashtray, as she does at one point. The screw begins turning for the father-daughter sleuthing team when Anna Westin, a friend of Linda’s, suddenly vanishes. Shortly thereafter, there’s another disappearance: a woman whose name Linda finds in Anna’s journal. What links the two women? And is there a connection between their evaporations, and the inexplicable reappearance of Anna’s father after a 24-year walkabout? There is indeed—a tricky, murky one, drawing the Wallenders into a crucible that tests their relationship emotionally and puts them at odds professionally. 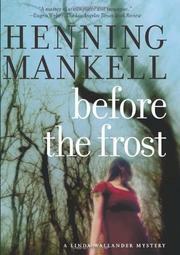 Though Mankell’s novels can be painfully slow, they’re never without their virtues, and this case is redeemed by the electricity between a father and daughter too much alike.